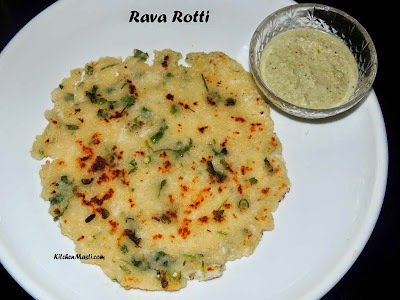 I have already published akki rotti recipe in one of my previous blog posts and this recipe which I am publishing today is stuffed akki rotti which is slightly different from the previous one. Here, we prepare dough made from rice flour and later stuff it inside a dough prepared from maida ( all purpose flour ). 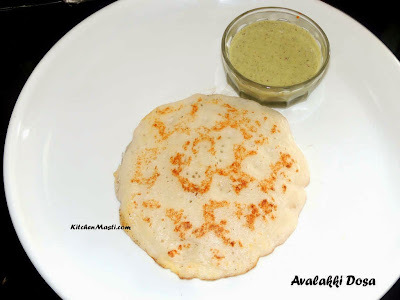 This is an excellent breakfast recipe and goes on well with garlic or coconut chutney but I usually prefer garlic chutney for this stuffed akki rotti. The process is a bit messy but once it is prepared, it tastes awesome. How To Prepare Stuffed Akki Rotti / Khara Holige. 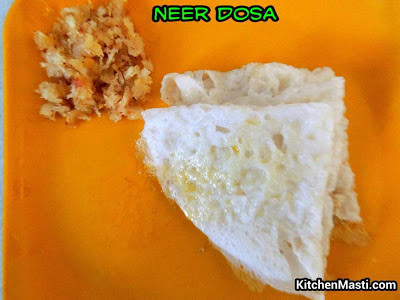 The time taken to prepare this is around 45 minutes and the ingredients mentioned here is enough to prepare 6 rottis. Rice flour - 1 big cup. Maida ( refined flour ) - 1 1/2 cup. 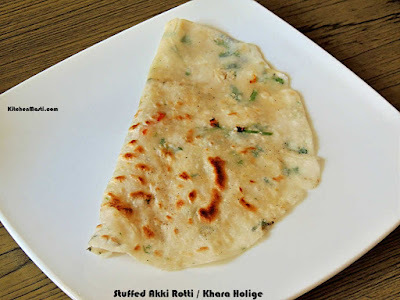 Method To Make Stuffed Akki Rotti. Here, in this recipe, we have to prepare 2 types of dough - the outer covering and the stuffing. First let's prepare the outer covering. Take a big mixing bowl . Add maida and salt into it. Knead the dough adding required quantity of water. The stiffness of the dough should resemble that of puri dough (not sticky ). Close the lid and keep it aside. Prepare small balls out of it. Heat around 1 1/4 cup of water in a vessel adding salt and boil for around 2 minutes. Add the rice flour at regular intervals and keep stirring so that no lumps are formed. Later on, switch off the flame. Add finely chopped green chillis, coriander leaves and mix every thing. Allow it to cool for some time. When it is completely cooled, form lemon sized balls out of it. Now, take the maida balls and flatten it slightly. Stuff the rice balls inside it by covering it completely ( just as you prepare for aloo parota ). Roll this rotti into thin big circles dusting with maida flour whenever necessary. Heat a skillet or a tawa. Transfer these rottis on to the tawa one by one and roast till brown spots appear on both the sides. Apply ghee or butter on both the side while roasting. Your delicious stuffed akki rottis are ready to be served!!!!. Remember that both maida dough and rice flour dough should not be sticky or else you may face trouble while rolling the rottis. The rottis may not taste best when it turns cold. This point is very important. While preparing the rice stuffing, do not add rice flour all together at once but add at regular intervals. The size of the maida balls should be smaller than the rice flour balls.